This is off topic but I really enjoyed this commerical. Be sure to turn your sound up. Bike Year Bought Here is a little bit of me and my bikes. I always meant to make a list and even did a few years ago. I've since lost it so I figured I might as well make another one before I forget some of them. By the way, be sure to reload a new copy of this if you've been here before since I'm constantly updating it. I've also recently started on a Car List. Click on the thumbnails for a larger view. 1 Fox Minibike 1959 My first two wheeler with a motor. Wow! Bought it for $50 from a neighborhood rich kid. 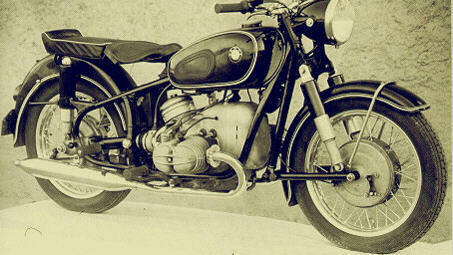 2 Moped 1959 Italian descent. Can't remember where I got it from or exactly when. 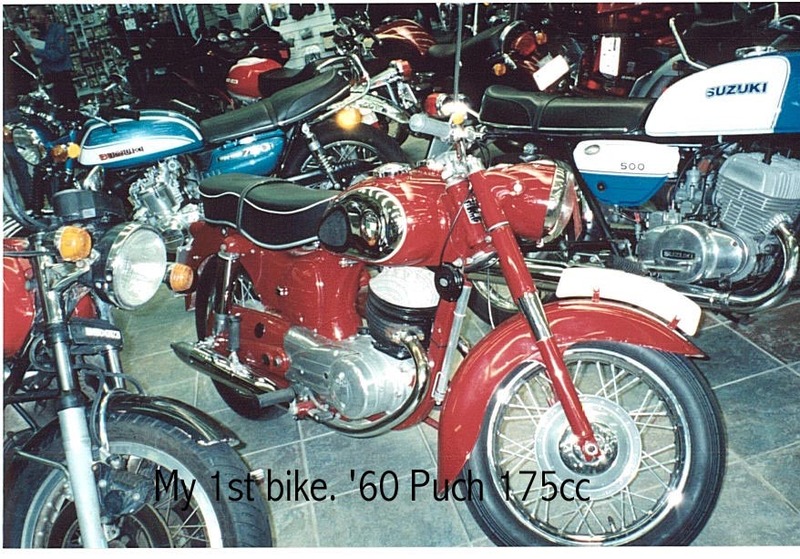 3 '60 Puch 175 1964 "Twingle" 2 cylinder two stroke, one combustion chamber, one plug. My first real motorcycle. 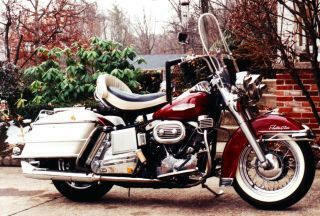 Imported by Sears :-) On a ride in New Zealand in 2000 we happened by a used bike dealer in Christchurch. Unbelievably he had this one on the floor. I almost bought it except that the shipping would have cost more than the bike. I figured I'd hang it from my garage ceiling or something. Silly idea. Check out the other bikes he had. It was like a vintage used car lot. 4 '64 Ducati 250 1965 Found it parked in Hells Kitchen better known as New York City's lower west side. I left a note on it and was contacted by the owner who had me come to his apartment to finalize the deal. He signed over the paperwork while laying in bed with his girlfriend! Those were the '60s after all. I crashed this one into a VW Beetle broadside. Some girl drove it into the main drag from a side street without looking. She got to the middle of my lane, took one look at me and stopped. I flipped over it landing on my feet dropping both arches! 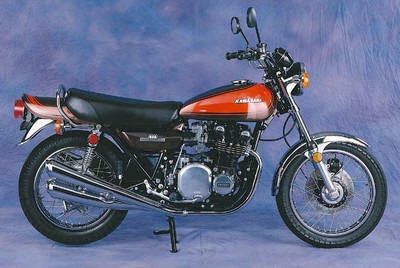 This bike and bikes in general are most likely responsible for my being alive today. In 1968 I was drafted during the Tet offensive. Two guys left the induction center not on a military transport, one of them was a heroin addict and the other was the guy with flat feet, me. The radiologist responsible for making the call was a Norton rider (wink, wink). Amazing how things work themselves out. Actually, that could be the story of my life. Things always just seem to work out. 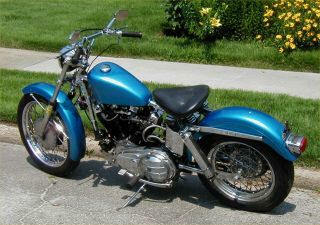 6 '50 Harley Hydra Glide 1968 Purchased from the HD dealer in West New York, NJ. Mine had a chrome tank and had been converted to foot shift. I think it was an ex-police bike. It was by far the hardest riding bike I've owned. No rear suspension other than the sprung seat! I rode this bike all winter that year. I remember getting all layered up including a hooded parka in order to ride. As long as the temps were over 20F and there wasn't ice on the road I was good to go. Only problem was trying to get the bike kicked over. In that temperature the oil was like molasses. 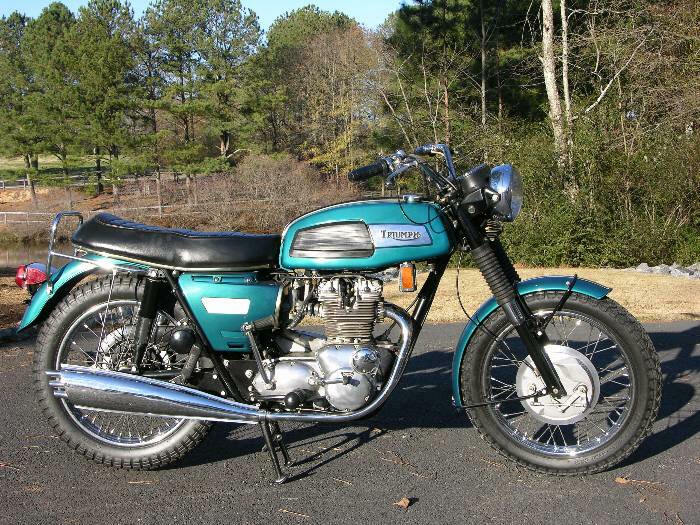 By the time I'd get it running I would have stripped off most of my cold weather gear and be sweating like a pig. I remember collapsing on the seat one day in utter exhaustion. I ended up pushing it over to the hill near my house so I could coast down and bump start it. Fortunately it started or I would have really been up the creek. 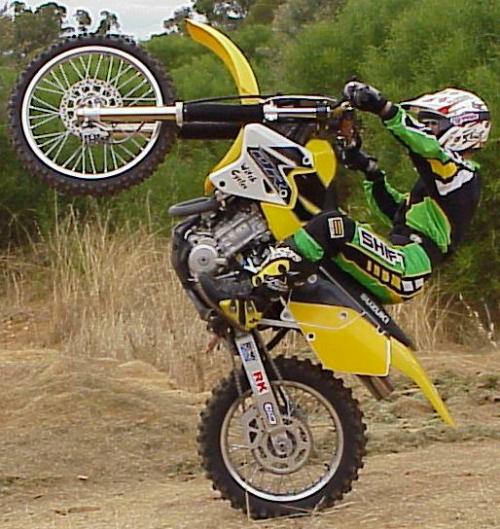 This was one of those bikes that had the timing retard built into the left grip. God help those that forgot to retard the timing before trying to kick it. The bicycle pedal they used to kick start it was positioned perfectly to either toss you over the bars or simply break your leg. No liability worries in the Eisenhower days I guess. 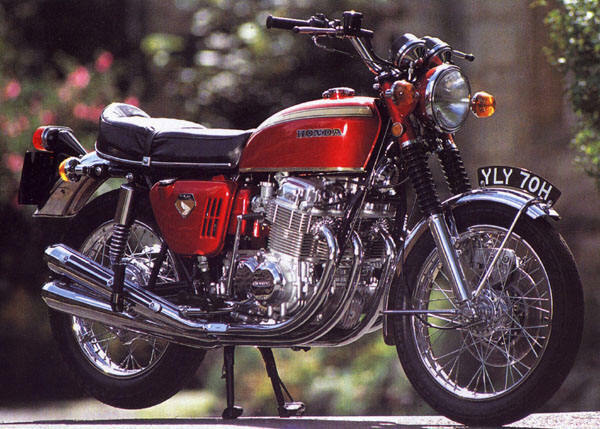 12 '71 Honda CB750 1971 In Gold from the House of Power. This was the only picture I could find in the right color. Mine didn't have all the add-on crap pictured. I did add a Vetter Windjammer fairing during the winter of 1970. As a matter of fact, right after New Year's 1971 I hooked up with another couple of guys and left the New York area for the warmth of Southern California. I got a job as the service manager at a Suzuki/Triumph shop in Dana Point. While there I installed a kit consisting of modified 350 pistons which added lots of power but also made it ping. I never rode it much after that. 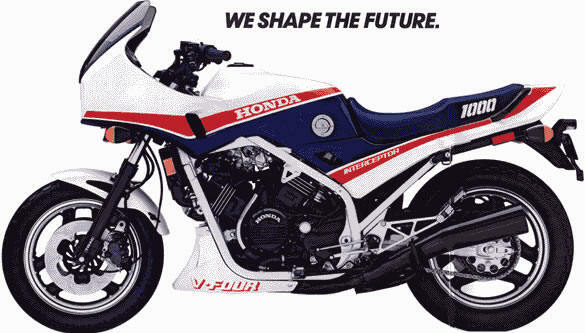 The guy who machined the pistons to fit had a shop in association with Long Beach Honda. His name was Herb Leach (sp?) and I was in awe of his abilities. He was probably in his mid to late 60's by then and seemed to suffer from really bad flat feet. Not a good thing for a machinist I've since discovered. One day he was on his way to San Diego with his wife on vacation and stopped by our shop in Dana Point just to visit. I was sooo impressed :-) My most famous customer at the shop was Bruce Brown of On Any Sunday fame who lived across the street. 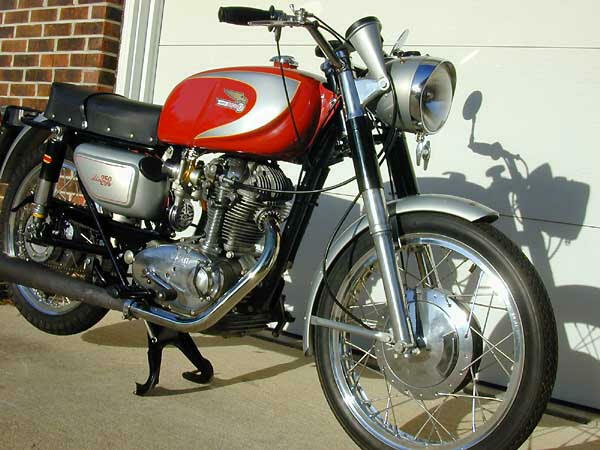 It seemed he had a Triumph Cub that needed an engine rebuild. 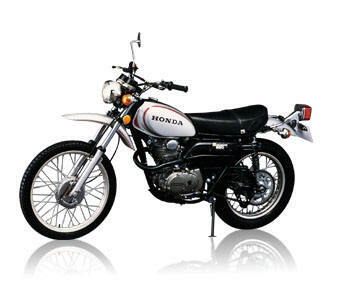 14 '72 Honda XL250 1972 Purchased from the Honda dealer in Santa Cruz, CA. 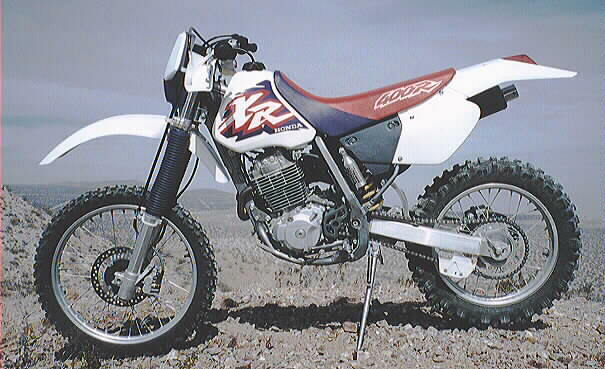 I always told myself that if Honda ever made a "big-bore" 4 stroke dirt bike I'd buy one so I did. Working for Mazda at the time as a Factory Service Rep, I was living in Aptos, CA which had some really neat forests nearby. I spent quite a few weekends exploring the Forest of Nisene Marks on this bike. I eventually added a big-bore piston to it which made a great wheelie bike out of it :-) This bike did teach me a life long lesson, though. At one point I decided to give it to my girlfriend Irene and teach her to ride. That was one of the more traumatic mistakes of my life and one I never duplicated. One day she went to her job at the local A&W drive-in and while she was gone I up and sold it on her. Probably saved her life. And mine! 17 '75 Honda Goldwing 1975 This was one of those impulse purchases when Janie and I had nothing to do on a Saturday. We took a drive in my '71 XKE over to Long Beach Honda and this is what I ended up riding home. I eventually put a Vetter fairing on it which probably was a mistake. I never much liked it after that. Now there's a gap of a few years or maybe its a mental gap, I'm not sure, but I can't remember another bike until I bought the following bike used from my neighbor Jerry in 1981. 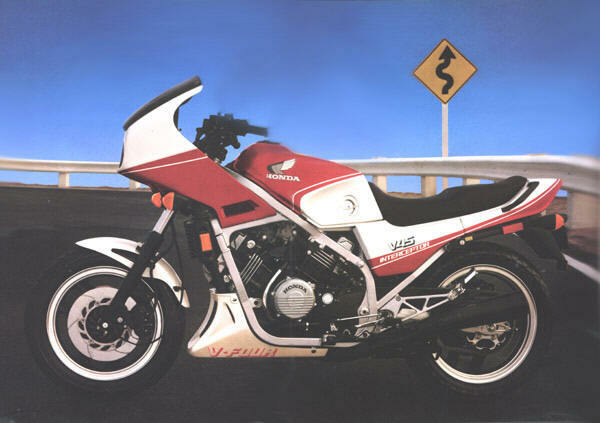 20 '84 Honda 1000 Interceptor 1984 Purchased from San Clemente Honda. Turned out not to be the case unfortunately. It was definitely faster but rode like a rock. Besides, the 16" wheels were really bad in the wind to the extent that if it was windy I really didn't feel like riding. I ended up selling it to some kid. 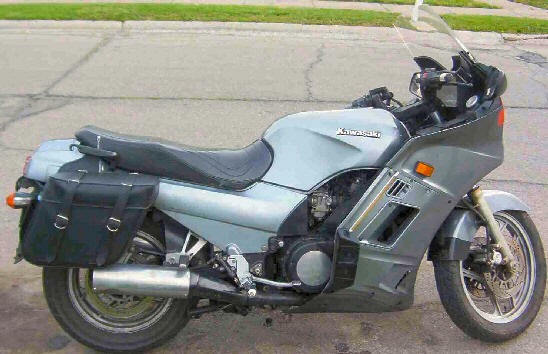 It was the only time I ever felt bad about selling a bike to someone since I was sure he was going to get killed on it. This was reinforced as he wheelied down the street after taking delivery. I stuck the money in my pocket and shook my head. 21 '85 Honda V65 Sabre 1985 Purchased from Champion Motors in Costa Mesa, CA. This was another impulse purchase. I put a Hondaline full fairing on it and lower bars. It was really fast but a clunky shifter. 22 '73 Kawasaki Z1 1985 I came across a used Z1 so I decided to buy it and do a little restoration work. This included replacing the tank, all the plastic and exhaust which was still available surprisingly. I also tore the engine down and repainted the cases black. I decided to cook them in our kitchen oven while Janie was out shopping. Lets just say it was a bad idea. Stinky! 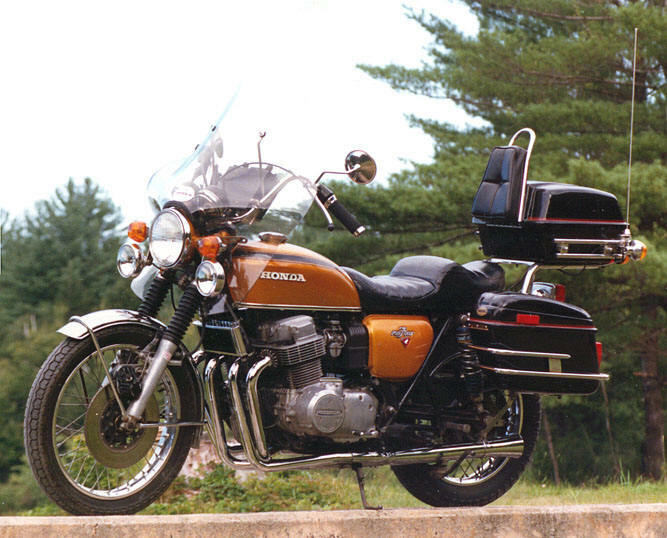 Whoever said, "you can't go home again" probably didn't know it applied to old bikes as well. 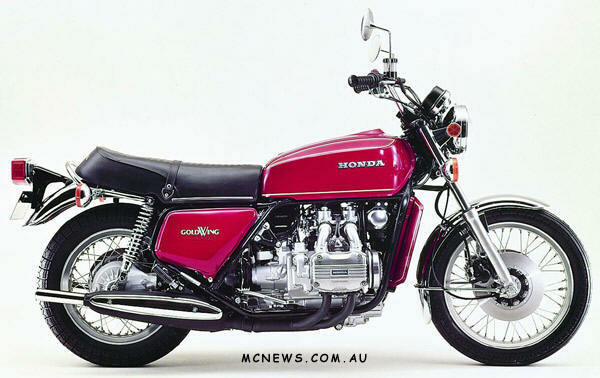 This Z1 just wasn't like I remembered it. I eventually sold it to an employee of mine who turned around and sold it to a Japanese collector for a big profit. He did bring me some pictures, though. Thank you very much. 23 '85 BMW K100RT 1985 Purchased from Mission Viejo Honda/BMW. 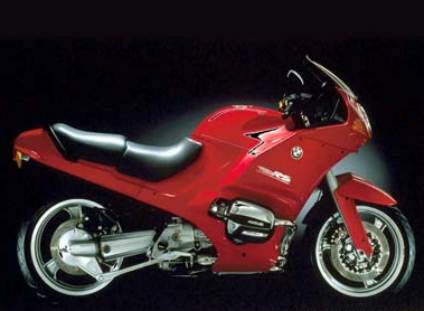 This was my first modern Beemer. Actually, I hated this bike. It vibrated and radiated too much heat. 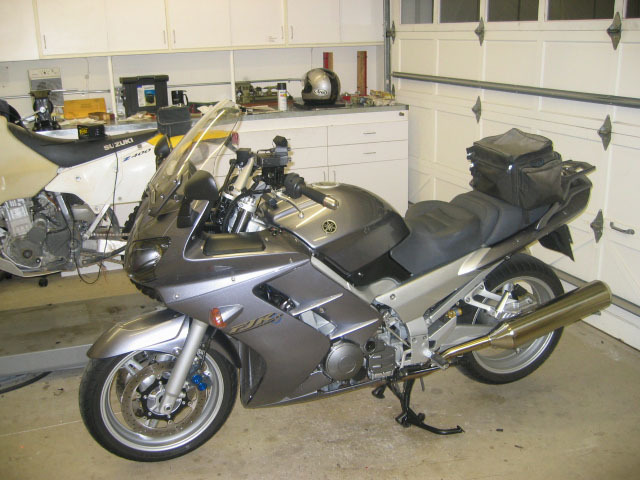 I didn't keep it long eventually selling it and getting a..
41 '05 Yamaha FJR ABS 2005 Purchased from Huntington Beach Yamaha 5 days old AFTER the deer hit on the way to the FJR rally in Idaho. 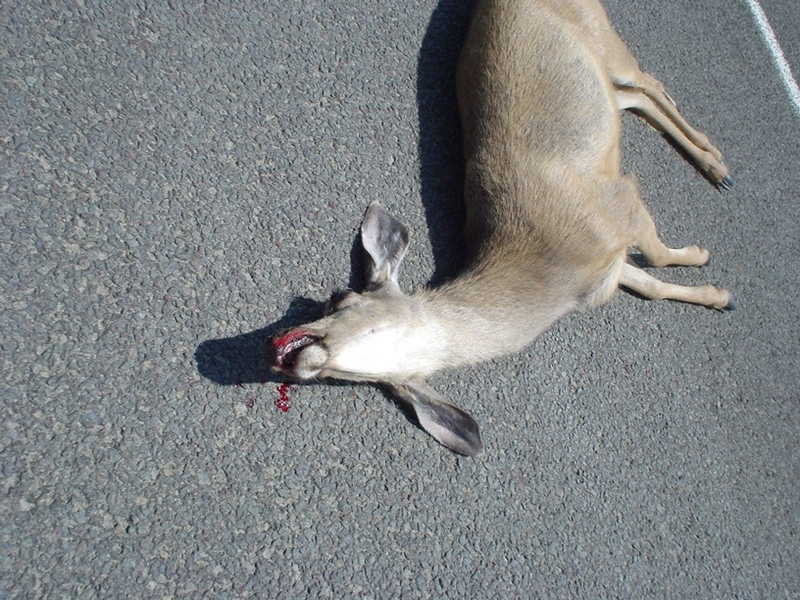 Here is the victim courtesy of Roozbeh . 42 '05 R1200GS 2005 From Irv Seaver. Since getting this one the FJR went on the battery charger and eventually out the door. This GS is smoother and faster than the previous ones. I've added a full Remus exhaust system, free flow air filter, Wunderlich Power Controller, Ohlins suspension, Russell seat, 17" RT wheels and tires. I'm really enjoying it so far. 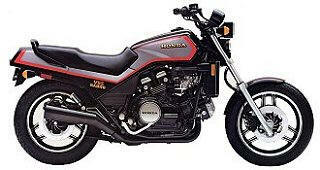 I originally bought it as a summer bike since the FJR is miserable in hot weather but it quickly became my main ride. Fantastic handling and with the updates it pulls like a freight train. 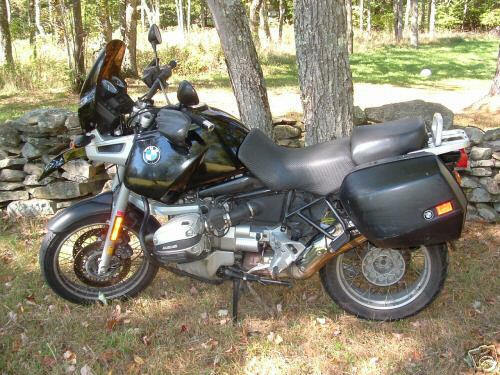 43 '07 R1200GS 2006 From Irv Seaver. I put 25,000 miles on the '05 and thought I'd go for a new one with the updated ABS system and other upgrades. My friend Gary Holland took the '05, which as of Aug '11 has over 120,000 miles on it, with most of the accessories intact so I'm doing it again. I've added powder coated gloss black 17" RT wheels with Avon Azaros, Adventure windscreen with winglets, Remus can only (the '05 was a bit too loud with the full system), my Russell seat (tried a Sargeant but didn't find it any better than the Russell) and a bunch of electrical junk including GPS, detector and heated vest control. Ohlins are coming as soon as they're off backorder. 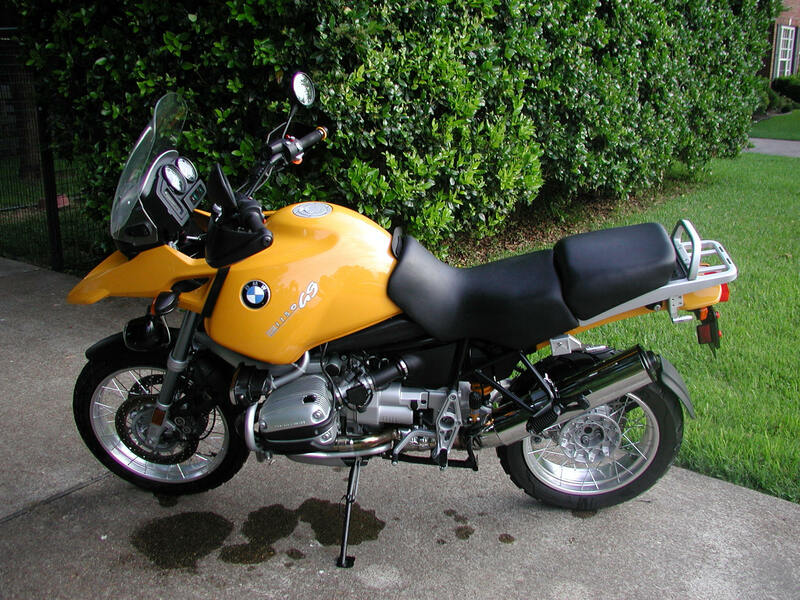 44 '08 R1200GS 2008 From Irv Seaver. I really didn't need a new one but, oh well :-) This one has all the same add-ons the '07 did including a new design Remus full system, Ohlins in place of the ESA which was so-so, R1200S 17" wheels, Adventure screen and winglets, the seat from the '07 and the prerequisite electrical goodies. The '08 has a few more ponies, revised geometry and a new trans. My friend Jim took the '07 intact with 26K on it. 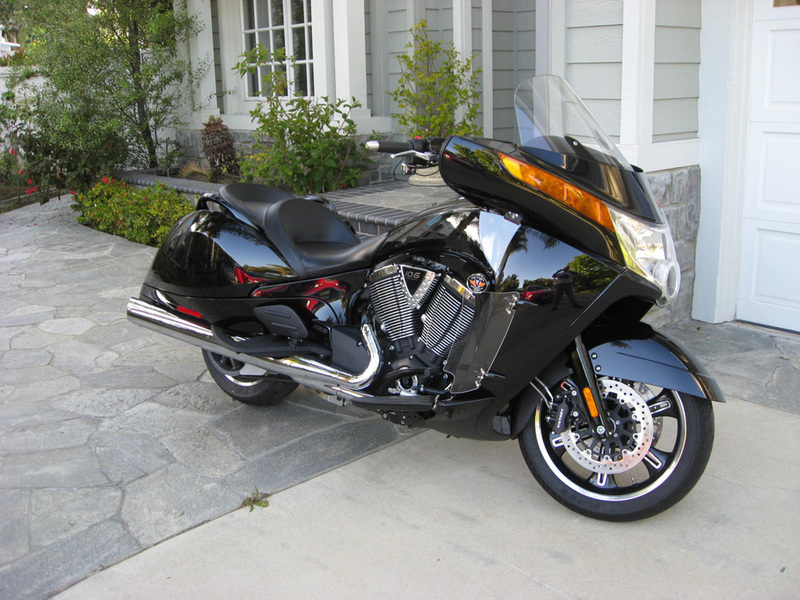 I sold this GS in May 2012 to a guy from Colorado. 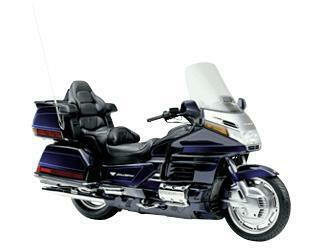 I have a Triumph 1200 Explorer on order. It just seems like its time for a change. 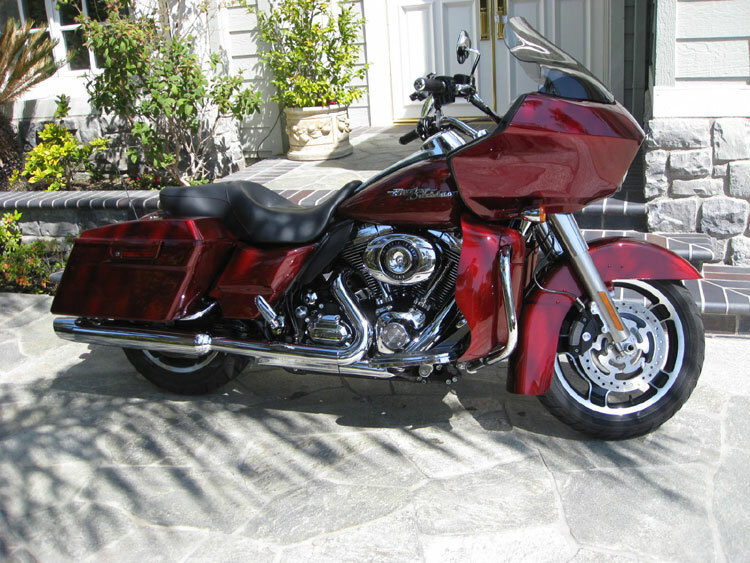 45 '09 Harley Street Glide 2008 Ok, don't ask why because I have no idea. I've had my eye on one for a couple of years now so I figured I might as well go ahead and get one and see what it's all about. I have a bunch of Beemer friends who also have Harleys and they all seem to really like them which was part of the motivation. 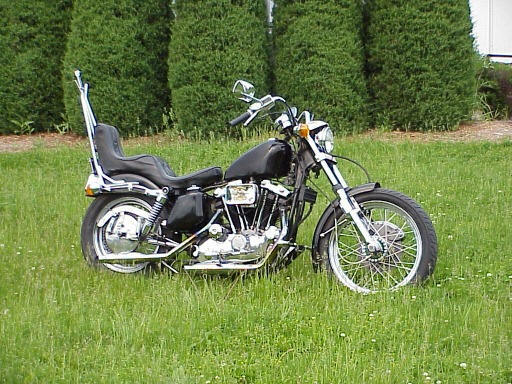 So far I've replaced the seat with a more comfortable one for Jane along with a backrest, replaced the rear shocks with Works Performance in order to raise the rear to the height of a regular Electra Glide, added hard lowers and upped the engine to 103 cubic inch with cams and a Power Commander. The exhaust is stock and will stay that way! One big issue is wind buffeting so I'm working on a solution. 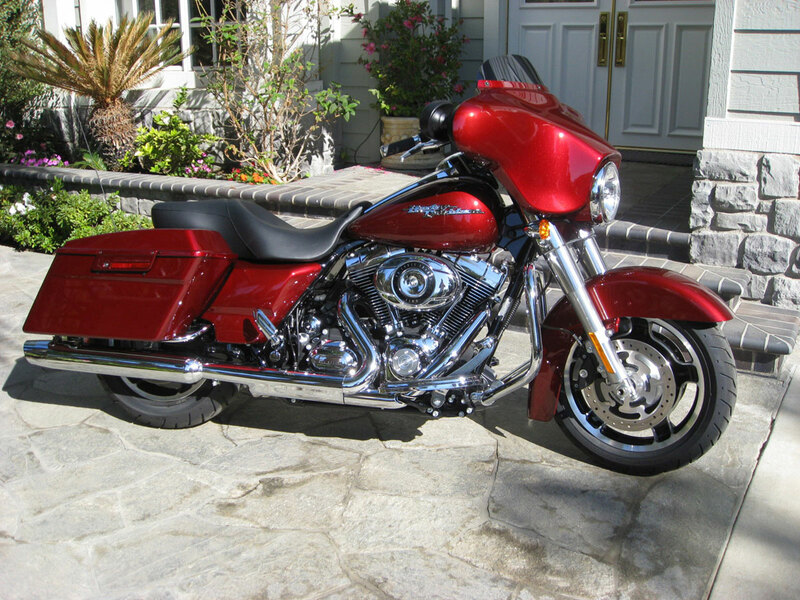 And NO, I'm not getting any tats to go with the bike :-) Update Never being one to leave things alone, I have converted the Street Glide into a Road Glide. It was pretty involved but gives a much better handling and riding bike. 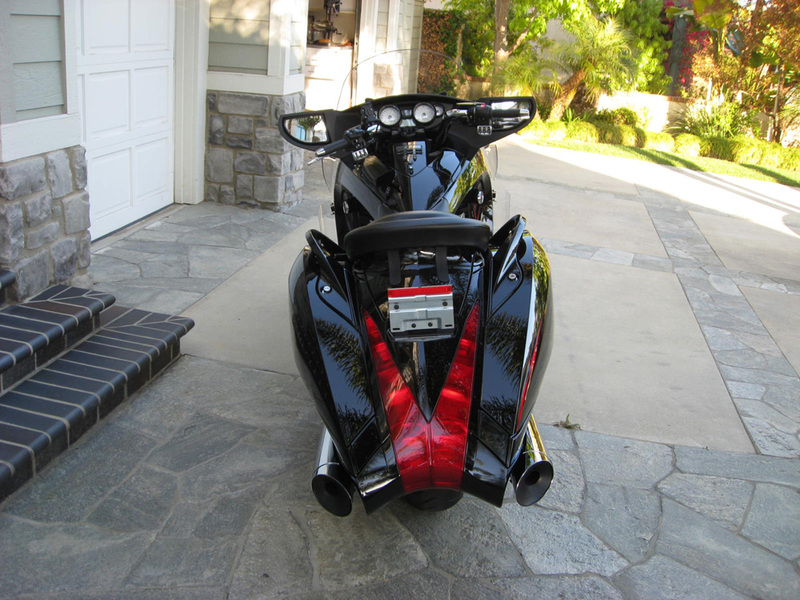 The new fairing is frame mounted while the original was fork mounted. After 22,000 miles and many mods to the suspension and after various different windshields I gave up. I couldn't get it to ride reasonably and the buffeting was still bugging me. I put it on eBay and it sold to a really nice guy from Clovis. He flew down to pick it up and really likes it. 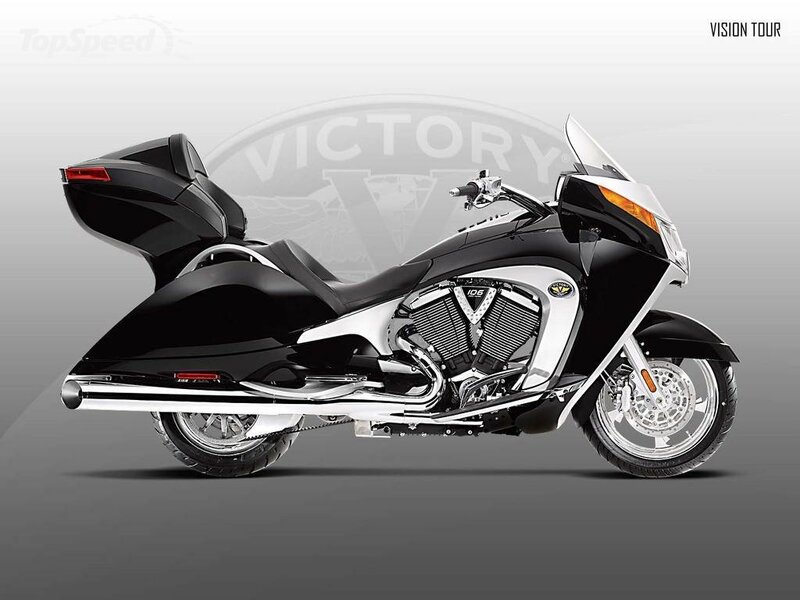 One of the Victory dealers locally had 3 days of demo rides so I went each and every day and ended up with a..
46 '10 Victory Vision 2010 2010 Victory Vision Premium. I really had trouble with the original looks which is the first picture. Too spacey looking with the top case attached and the amount of chrome, etc is not my taste. 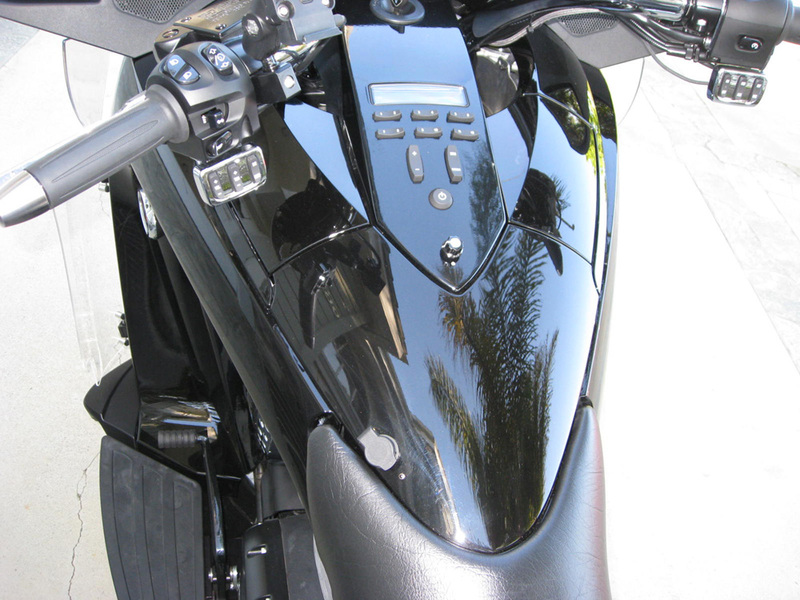 The dealer offered to swap out many of the parts for those from a Vision 8 Ball. I can live with the result which are the other pictures. As a matter of fact its kind of growing on me. The suspension and wind management are perfect. It rides and handles like a much smaller bike. I added a backrest and rack for Jane so we can leave the top case off. Gary took it up to the Bay area while I was in Europe and had high performance cams installed. It runs great. 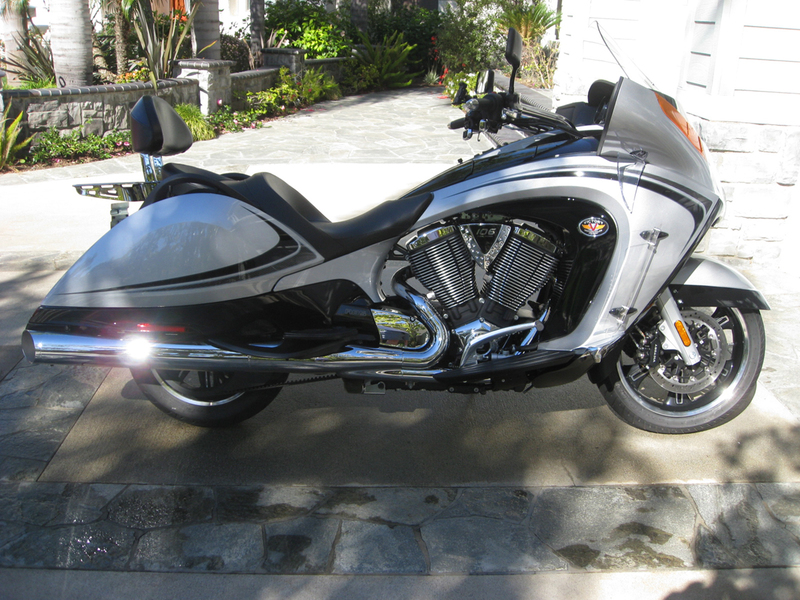 So great that Bob decided he wanted it so I sold it to him and bought a ..
47 '11 Victory Vision 2010 2011 Victory Vision. Bob wanted the black '10 so I bought a new one :) This one has an improved transmission. I'll add all the extras the '10 had. 48 '13 Triumph Explorer 2012 After so many years of BMWs I decided it was time to try something else for a change. The Explorer is Triumph's take on the GS. 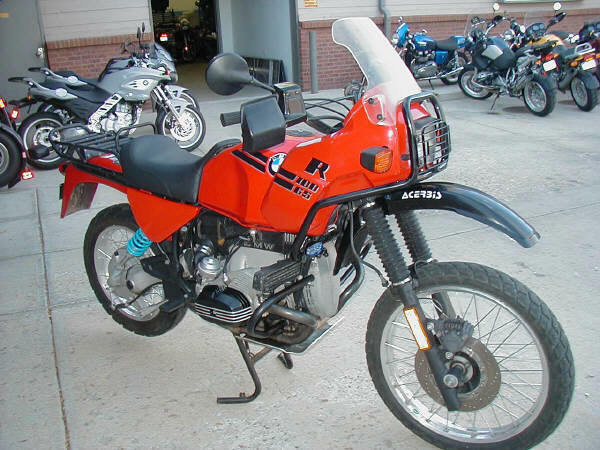 They are very similar in that they are both Adventure bikes made for the occasional dirt road excursion. The big difference is in the engine. The Explorer is a 1200cc 3 cylinder torque monster. It is the smoothest engine I've experienced and makes serious power beginning barely off idle. It does have a couple of problems that will be addressed. The first is the seat which is murder after a hundred miles. The GS seat wasn't any better actually. 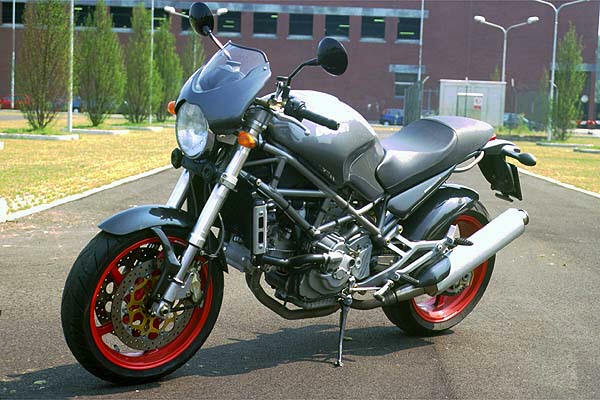 The other problem is the suspension which is just plain too stiff for a street bike. I'm going to give the bike to Racetech for a couple of weeks and let them do their magic. I'll put up a picture as soon as I get a chance. I ended up installing a Wilbers WESA shock which is absolutely the best shock I've ever had. Super plush, well controlled and electronically adjustable for damping. Great! 51 '14 BMW R1200RT-LC 2014 2014 BMW R1200RT Liquid Cooled. 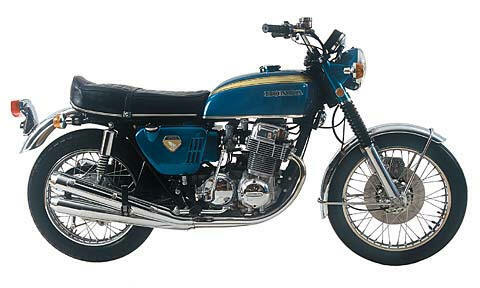 I just decided that at this age the height of the GS was getting to be a bit much. I could have just traded it for a low model but the new RT had been so highly touted in the magazines I figured I give one a try. It turned out that it actually works as a touring bike and as a weekday play bike so both the GS and Vision got sold. 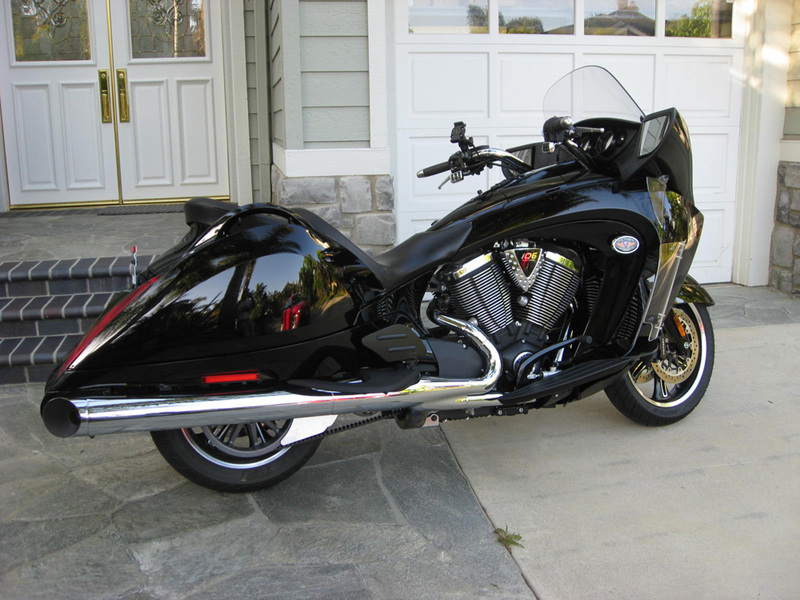 The GS went to my friend Richard Phillips and the Vision went to a fellow in Texas. Both seem to really like their new bikes. I added a couple of trunks, the one in the picture for day rides and a great big one for trips with Jane. The only mod it will need is a seat. This one stinks as usual for BMW. I took a run with Jane up to Russell and had them make us a set of their Day-Long seats. Problem solved! 52 '15 Yamaha R3 2015 2015 Yamaha R3. I spent a day with Dave and Jeff from Motorcycle Consumer News testing some small sport bikes. This was one of them. It was by far the best and an absolute blast to ride. I kind of forgot about it till the article came out and then I got excited all over again and went and bought one. Its actually pretty comfortable, has great suspension and a 12,500 rpm engine. Just a fun little bike. Not something I'd actually go anywhere on but great for a day's ride in the twisties. I ended up upgrading the suspension, converting to more upright handlebars, a Saddlemen's seat and lowered the pegs. 53 '16 BMW R1200RT-LC 2015 2016 BMW R1200RT Liquid Cooled. Basically the same as the 2014 except with keyless access and in a very nice gold color similar to the last Vision. Seems the same as the 2014 except this one shifts better particularly when using the shift assist. I guess they just keep improving things as time goes on. The 2014 had about 40K on it. My friend John ended up adding it to his collection. 54 '16 Triumph Speed Triple R 675 2016 2016 Triumph Street Triple R. The R3 was great but it just doesn't have enough power particularly when passing. You end up spending too much time in the wrong lane exposed. 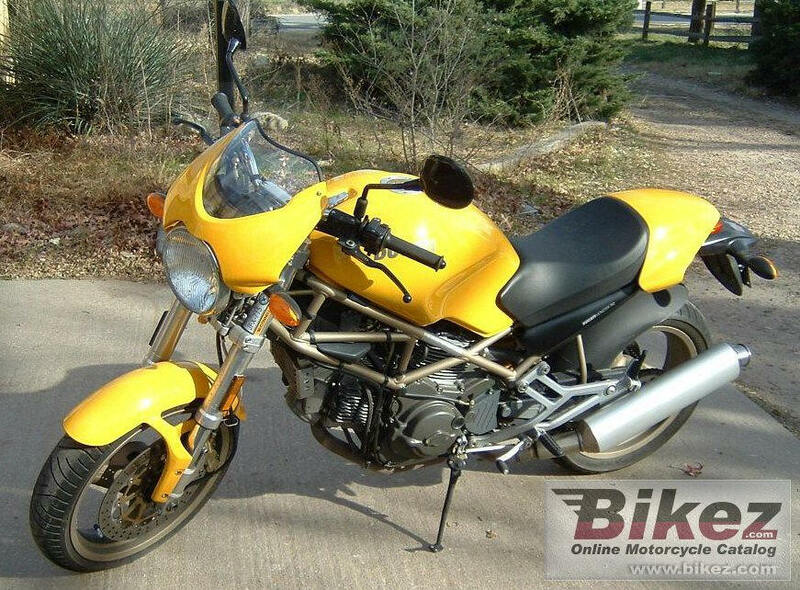 This is a really nice little bike. Pretty quick and reasonably comfortable. I've added upgraded suspension, a custom seat, Dart windshield, 200 mm bar risers, heated jacket connection, heated grips, lowered pegs, quick shifter and some dress up items. Its a good one! 55 '16 BMW S1000XR Premium 2016 2016 BMW S1000XR. As much as I enjoyed the Street Triple and in lieu of all the money I spent on it I just couldn't get this old body to fit. 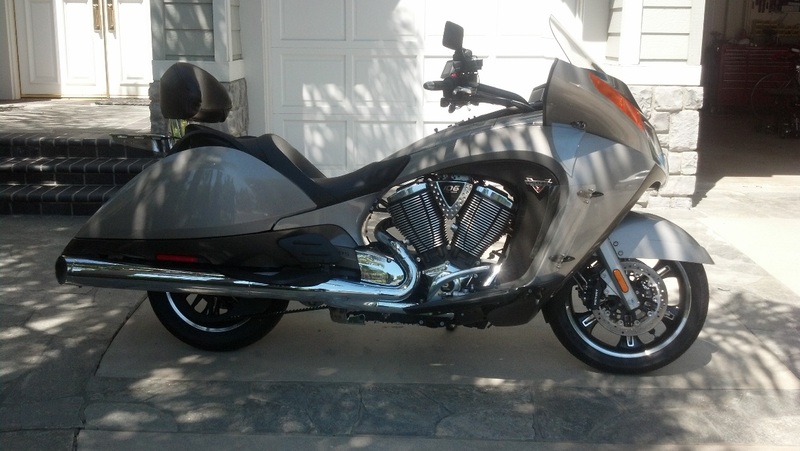 I ended up selling it at 9660 miles to a really nice guy with 3 kids from Pasadena. In the meantime I bought this 160 hp beast of an XR. Its riding position is similar to a GS which fits me fine. I've already made a few mods including crash bars, rearsets, tailbag, MRA Vario screen, Synto levers, BMW Comfort seat, Tractive suspension and removed all the luggage mounts and passenger pegs. The engine is a lot like the Triple in that it is super smooth and high rpm. This is a fun one! 56 '15 BMW R1200GS Low 2017 2015 BMW R1200GS. For our long trips the R1200RT was just getting to be too big and heavy so I've gone back to a GS with Adventure boxes on it. I bought this bike used from my friend Richard with 4000 miles on it. Jane and I rode it 12,000 miles around the USA during September and October '17 and it worked perfectly. 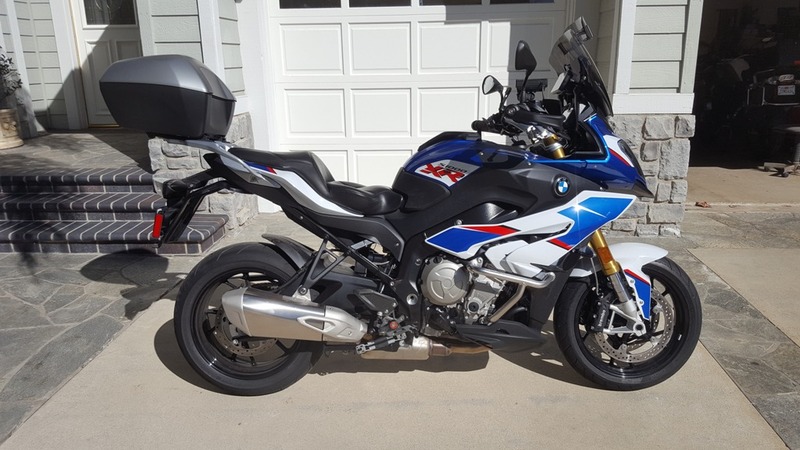 57 '18 BMW S1000XR Premium 2018 2018 BMW S1000XR. The '16 XR amassed 34,000 miles in 12 months so I decided to trade it in on a new '18 in this beautiful tricolor design. Really gorgeous The bikes are basically the same even though this one buzzes less and doesn't fuel quite as well as the '16 did. I have a fuel controller coming to richen it up a bit. Other than that, I swapped all the accessories over during a two day marathon. 58 '18 BMW Honda Goldwing Tour 2018 2018 Honda Goldwing. This one is fully equipped including their DCT transmission. Jane and I did a 12K mile ride around the country during the summer of 2018 and the bike was great! I've added some accessories including a Traxxion rear shock. The OE shock had way too little damping which caused it to wallow in the twisties. As of today April 8, 2019 it has 29,450 miles on it so its getting used :-) I also had the wheels powder coated matte black which looks really good. 59 '17 Honda VFR1200X DCT 2019 2017 Honda VFR1200X DCT. 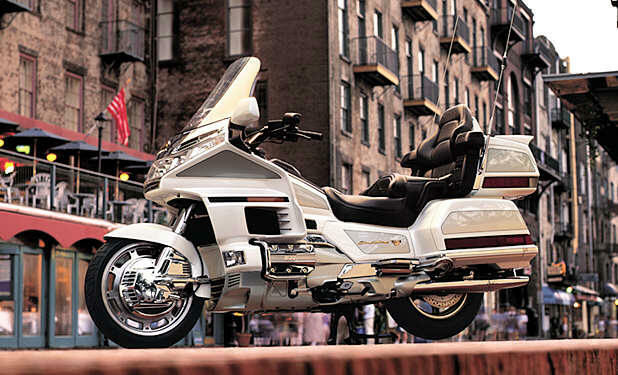 I've enjoyed the Goldwing's trans so much that I went looking for one of these all over the country. I found this leftover in Missouri so I bought it. The S1000XR has left and this took its place. 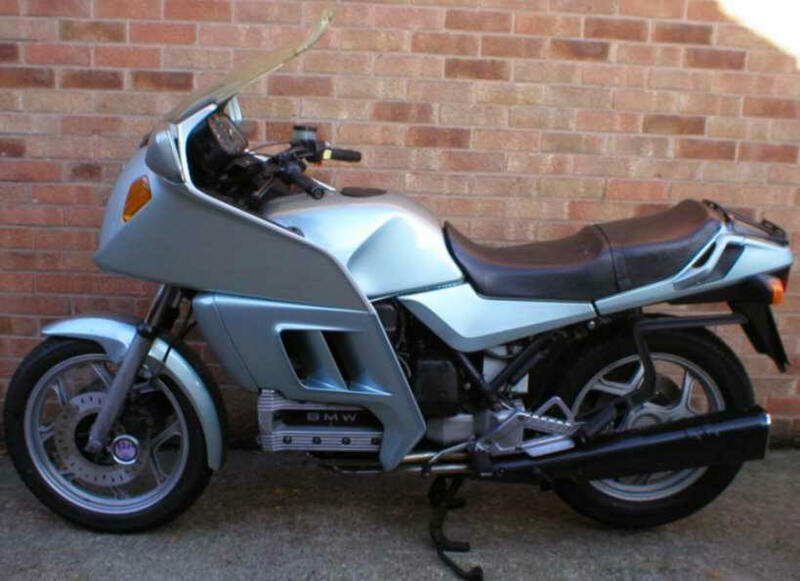 I'm really enjoying this bike particularly its V4 engine and the DCT trans but the bike needs some work. The suspension is garbage and the seat is killing me. I installed Traxxion's cartridges and springs which I'm not sure are the best solution and I have a Wilbers electronic shock on order. I'll decide on the front once the rear is fixed. I also have a date for a Russell seat. I added McCruise cruise control from Australia which works as well as any OE setup I've had. Other than a tailbag, that's it. The combination of this engine and the DCT actually works better than the Wing. Super smooth engine and trans. 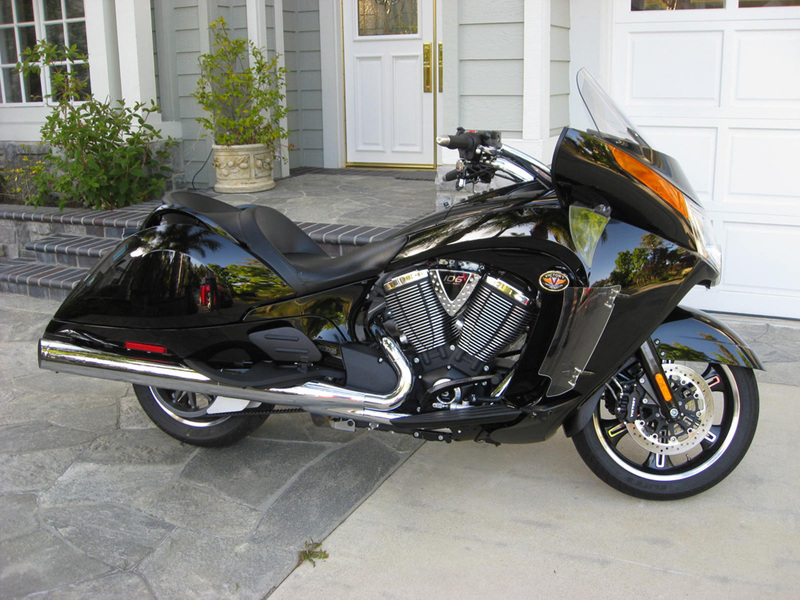 Bad news :-( I sold the FJR to one of my riding buddies, Rich Daniels. 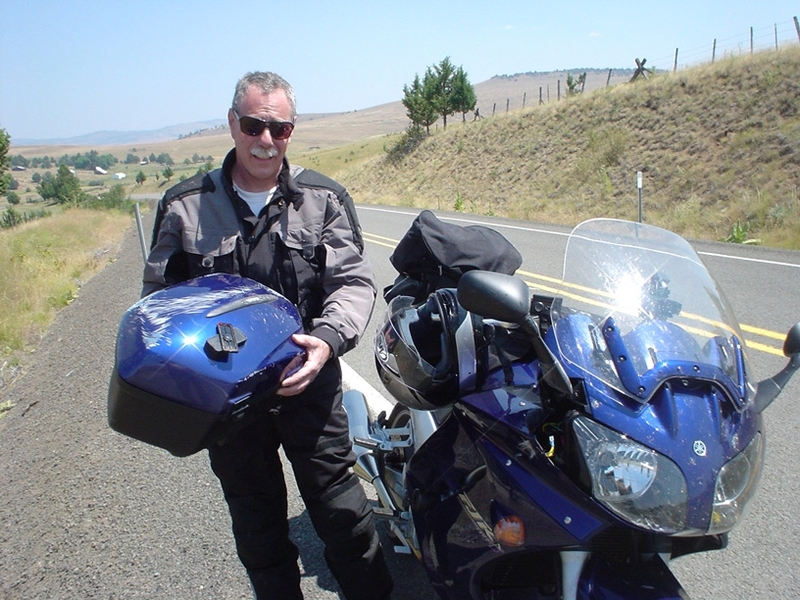 He was riding it alone in May '06, wandered over the double-yellow on Naciemento Lake Road near Paso Robles, CA and hit a truck head on. I got the news during dinner on the last night of our Beach's Italy tour. I attended his funeral with my friends Gary Holland and Alan Redman. The church was overflowing with friends, family, colleagues and students of his. Many wonderful thoughts about Rich were shared that day. Things about him I never knew. He had touched many people in his lifetime and had left his mark. What we do is very dangerous and we all know it. Rich loved motorcycles. At the time of his death he owned at least 35 special motorcycles and was in the process of building a shop and museum on vineyard property he owned in Paso Robles. It was a lifelong dream of his and about to become a reality. He'll never get to enjoy it now and that is really a shame. Our thoughts are with his wife and two children who will miss him most.